Where Roots And Wings Entwine: Pebble Grey LED Cosmetic Mirror giveaway. Pebble Grey LED Cosmetic Mirror giveaway. 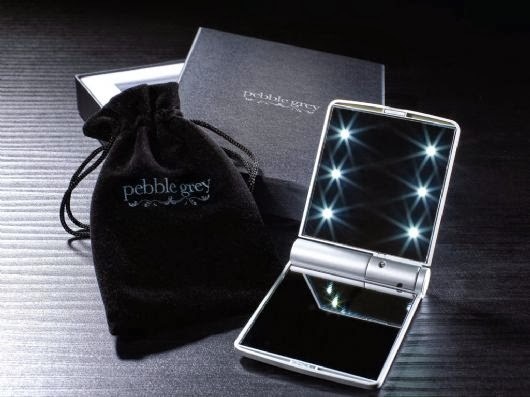 Following on from my review of the Pebble Grey LED Cosmetic Mirror the lovely people at Pebble Grey have kindly offered my readers the chance to win one of their LED Cosmetic Mirrors. Specialising in contemporary and modern mirrors and bathroom accessories, Pebble Grey have a vast range of bathroom mirrors, cabinets and accessories that are both stylish and practical with feature LED lighting and pre-installed extras such as demister pads, shaver sockets and motion sensor switches. 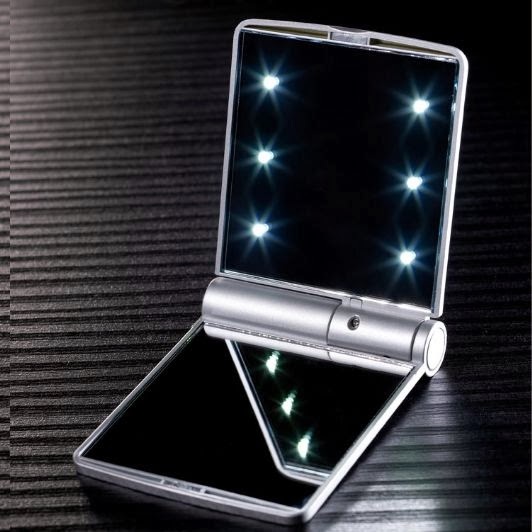 1 x Pebble Grey LED Cosmetic Mirror (RRP £24.99). I'd give it to my mum. Its very useful with the lights! I love this compact and elegant mirror!I would be keeping this for myself.There will be no more excuses for me to have random nose hairs,or make up tide marks!I need this in my life! Love that it's illuminated.Ordinary mirrors are useless if your eyesight is not what it was. i would love to keep it for myself but my daughter would want it as she has only just started using make up and would love this!!! i would love this for myself, esp plucking eyebrows, i can never get the right light! Need light in my life! I'd give this to my mum, her eyes aren't as good as they used to be so I think the light would be useful. I like its style, it looks sturdy and compact. I'd like it as a treat for myself (for a change). I love the light and the way it shines. I would keep it for myself - love that its illuminated! Love the compact size combined with lights & I would keep it for myself. Really love the lights - I'd gift it to my best friend. I think it's gorgeous, I'd definitely keep it as I'd get a lot of use out of it. I love that it looks so stylish, I would give it to my mum as a little gift. this would be very useful for checking /applying lippie in the car when i arrive. definetly keep it my self! I think that the light is very useful. I would probably give it to my mom. I'd give it to my mum. I would keep it for myself. I love the LED lights, they make life so much easier. I'd keep it for myself. It would come in so handy. I do my makeup before its light in the morning and then I would use it again to apply my make up on dark evenings when I'm getting ready to go out. The fact that its illuminated is just great, you can use it anytime day or night. I would give this as a gift for my daughter. I would give this to my beautiful daughter as she deserves it. Very classy and practical - no chance of me giving it away! There is something really 80s about this mirror. Mega desirable. I'd give it to my Mum - she's been after one like this! Love it is small and compact and it will go to my 25 year old party girl daughter. Beautiful gift for my work colleague. She is only 20 but my absolute right hand woman! Love the colour and the lights. I would have to keep it for myself, it is fabulous and perfect! I would love to keep this myself, it is so stylish and the lights just make it even better. Would be perfect for teenage daughter! Give it to my sister LOL ! I would like to keep it for myself but I'm guessing that my daughter will steal it off me. love the lights make it easier to use!! would try and keep it for myself but think my daughter and niece would try and get it!! I would give it to my mum, as she never goes anywhere without her ' face on ' and the lights would make it easier for her. I love the lights and would keep for myself! I love the light and would keep it for myself. I need it to help with my make-up these days! This mirror would be perfect for doing my make-up on the go! i love the light and size of it and i would keep it. It's just the sort of product my sister would love especially with the lights. My youngest daughter is becoming a teen soon. She is at that age where she is getting interested in make-up. As her room is not that bright and her eyesight is very short the L.E.D. lighting in this mirror will be a great gift for her. The lights make it much easier to see especially with my failing eyesight! I always struggle with the lighting in my house when doing my make up so this would be very useful. I would be keeping this for myself. I like the lights - such a clever idea! Would definitely keep this myself!! I'd treat myself as it's the perfect size for my bag and would be so handy when you go out for evening. I love the idea of being able to do my eyebrows and seeing what I'm doing, and of course I'd have to keep it for myself. clever sleek and stylish i would give it to my sister! the light is great I would keep it! I would keep it for me because I recently dropped mine and it has a huge crack. Also the lights would be handy because our power keeps going out with the storms, at least I'd be able to do my make up! Looks very stylish. I would give it to my niece. I love everything about it! I am obsessed with LED mirrors - i have 2 in the bathroom so this would be perfect for touching up my make up in dark restaurants! I love this mirror, It's a fabulous idea. I would keep this as a treat for myself as it would make putting my make-up on so much easier. This I would give my neice as a present, i'm sure she'd love it, Gorgeous. this would be great for my handbag!! I wouldn't be able to give this away as it's way too useful and cool. Would use this every day! I love the idea of a lighted mirror, it will help to get the make up where it belongs. i need this in my handbag! It's gorgeous and I would keep it all for myself! I would love it just for me , L.E.D .lights .... look good !!! I would keep it for myself as I always struggle to put my makeup on with not enough light!! What I love about the mirror is the sulvwr finish makes it look so expensive and the lights on it perfect for applying make up and when I am out and about. It would be a treat for myself. The light looks great - It would be ideal for nights out. I like the elegant yet practical design and beautiful packaging, I would give this loively mirror to my niece. This is fantastic! I used a lit-mirror at home to do my make-up by for touch-ups out and about this would be invaluable! Keep it for myself, it's great!